Princess Alaska Lodges are unique in the industry for their riverside and wilderness settings, offering comfortable and inviting accommodations and featuring signature Princess service. They are custom-built and strategically located near the top attractions across the 49th state, allowing you to soak in the atmosphere of each unique region and experience authentic Alaska excursions. Locations include Copper River, Kenai (Cooper Landing), Mt. McKinley (near Talkeetna), Denali and Fairbanks. 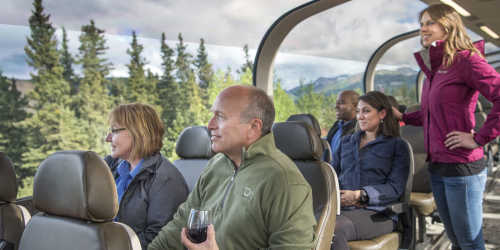 The best way to visit Denali National Park and Alaska’s interior is on one of our rail tour packages, combining stays at our Denali area lodges with scenic and relaxing train travel. These rail tour packages include train travel and/or motorcoach transportation between Anchorage and/or Fairbanks and Mt. McKinley Princess Wilderness Lodge or a Denali area hotel. Or, enjoy a night in each location.